Not more than twelve hours ago, they were thick in the trees of the parking lot, the skies filled with their birdsong. The males, jet-black with that flash of crimson on their shoulders, enough to startle anyone, were grouped like proud boys, vigorously singing for all they were worth while one female walked the concrete below. The air was filled with their desire, glissando warbling that used to fill the reeds, the water, the private places they called home just last spring. That was before Sam’s Club filled in their paradise and then paved it over. 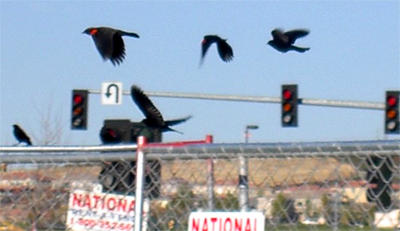 Today, they are different–not landing in the trees but instead flying high back and forth over the parking lot. There is no mating song, just a shrill cry as if in panic as the males fly from one construction zone to another. landing on the cyclone fence that cordons off the areas of dug up gravel…areas of “No Trespassing” signs, areas of hot tar burning their tiny feet when they land, areas that just last year were pools full of cattail reeds, simple private places to hide and love. Today there is fear. What happened overnight, between today and yesterday? This morning something has changed. There are far fewer blackbirds now; large seagulls fly overhead screaming and swooping in all directions over the red tile roof of Sam’s Club. A blond child in pink cowboy boots climbs down from inside a black S.U.V. and sees a red-winged male hiding under the savannah grass inside a concrete paving strip. Her father, his shopping list in hand, doesn’t notice her fascination. “Hurry up,” he tells her. He takes her hand and leads her away to the store’s front door. Folsom, located in the northern California foothills, one-hundred-fifty miles inland is not natural to gulls. Did Elliot Development Co. contract the seagulls to challenge the blackbirds? To get rid of them quickly? Is this the reason the blackbirds are subdued? The construction office, nothing more than faded white plastic on blocks was abandoned. No answers there. Across eight lanes of traffic named Iron Point Road, a small flock of black bodies gravitate together in a remnant of grassland, scared into flight whenever the light changes and hundreds of cars thunder by. There is no warbling, no beautiful love songs. Yesterday their music filled the air, but today their cries are silent. They know in their hearts it is over. Near the new Burger King two blackbirds huddle together, their feathers bedraggled, the look in their eyes so painful it could drop you to your knees. They hunkered down tight to a patch of dirt next to a water puddled that migrated through the concrete. With no choice they dipped their beaks and drank from the filthy run-off, the only water left. The blackbirds, denuded by man of their dignity stand in the field confused. They stand, then sometimes march in tiny steps here and there in the parking lot. You can see them when you lock your car door and head in to do your shopping. They will look at you with questioning eyes. They will ask you as you who walk by. But perhaps you, like most humans, will not look back to see what they are asking. Humans are usually too busy thinking about themselves to notice, in too much of a hurry to care. It’s a wonder that there are any birds left at the rate that development gobbles up habitat. If all the beasts were gone, Man would die from a great loneliness of spirit. For whatever happens to the beasts also happens to man. Continue to contaminate your bed and you will one night suffocate in your own waste. of the ripe hills blotted by talking wires. I am freshly back in Arusha, Tanzania – the safari city; fresh from the “greater Serengeti no-go area”; and looking around me at recent developments back in man’s world, I reckon that one hundred and fifty two years later, we are just about there! What a beautiful bird. We haven’t learned our lessons yet have we. Last night I couldn’t sleep for any length of time. I woke up completely at 3AM and understood that what was bothering me was the change in behavior and look of the blackbirds of our area. Two days ago I saw from afar, a strange and disturbing sight. In a small triangular area of our garden where I grow some sage, thyme, rosemary and lavender, I saw a very distressed looking male blackbird. Its feathers were all “puffed” out and irregular, he was lying on his side with his once bright eye, opened in what looked like mortal fear. I actually thought he was dead and his eyes were just opened. I let out a gasp and slowly walked closer to see more clearly. He allowed me within about 5 feet and then jumped back into the hedges where the blackbirds have their nests. That image stayed with me and has disturbed me in both waking and sleeping hours. What’s happening to the Blackbirds? It was what woke me up to the fact the I haven’t heard the blackbirds singing away in a few weeks. I noticed something was different in the evenings…. The tops of the trees are usually pedestals to the males who sing their hearty lungs out every evening, to my overwhelming delight. In the garden I have recently only seen what I thought was just ONE strange and afflicted looking male… now I realize I haven’t seen one NORMAL one! There are so few of them and all of them have missing feathers and are no longer shiny black but a duller black/brown. In their eyes I only see fear. Their song is gone. My heart is breaking for them. Nothing has changed in my own backyard that I can see, that might cause damage to them. We haven’t put down any pesticides or fertilizer. I manage to keep my husband from mowing the lawn every five minutes so that we have a little extra blurry greenery, the kind I so prefer. Does anybody know what’s up with the blackbirds? Sorry to be so long but, I’m so sad about this. I wonder what my grandchildren will know about Nature. Will there be anything left??? the United States of America. My young men (23 and 21) feel so angry and gyp-ped (jipped?) to realize the world is where it is. I pray (in my very own way) for them and for all and for the Blackbirds. They did come back. At least I saw one couple. I’m assuming there are a few more in the neighborhood. I will know better when Spring returns. I hope it won’t be Silent. I so miss the wild songs. Our neighbors made us chop back our hedges and I’m sure this has made winter that much more difficult for the birds. Sad. Stupid neighbors that need to control the greenery so…. I wish you luck in Tanzania. Fascinating. Scary. (no-go zone). Inspiring.